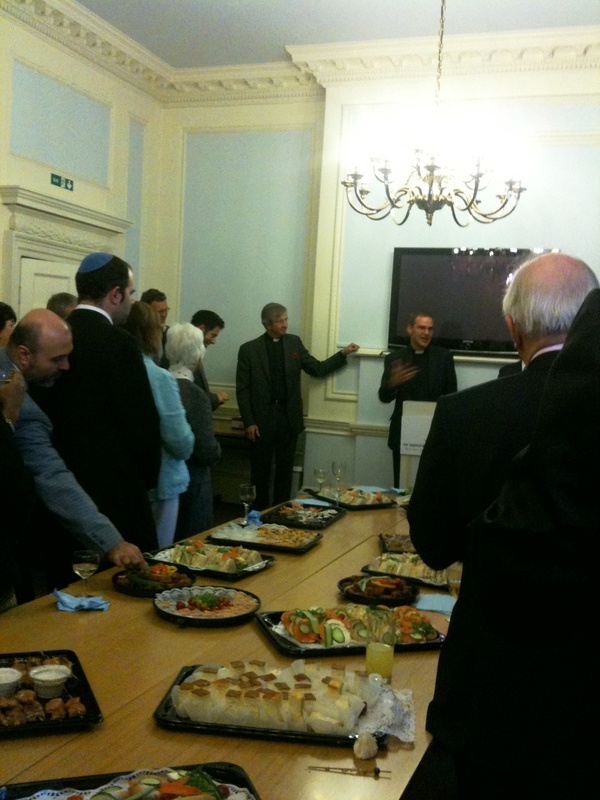 With a warm welcome and an exquisite spread of food, the Board of Deputies of British Jews held a reception on 5th May for the new Secretary for Inter Religious Affairs for the Church of England, the Revd Dr Toby Howarth. Toby has lived in East and Central Africa, India and Rotterdam. His recent work includes teaching Islamic Studies at Crowther Hall in Birmingham. Phil Rosenberg, the Board’s Inter Faith Officer, organised the evening and it was good to see Malcolm Deboo (Zoroastrian Trust Funds of Europe), Warwick Hawkins (Department for Communities and Local Government) and Harriet Crabtree (Inter Faith Network for the UK) in the crowd. LBFN welcomes Toby to London and we hope he will come along to one of our events before long. This entry was posted in Camden and tagged Board of Deputies of British Jews, Church of England, Lambeth Palace, Toby Howarth by Catriona Robertson. Bookmark the permalink.